A Director of McKinsey & Company based in Paris, Eric Labaye is the chairman of the McKinsey Global Institute. 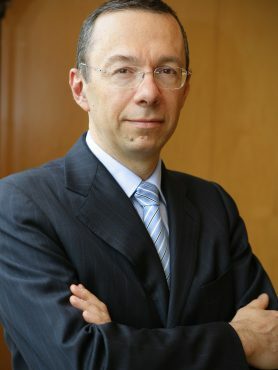 He was the Managing Director of the France Office from 2002 to 2010, led Global Knowledge and Communications from 2010 to 2013 and has been a member for 9 years of the Shareholders Council of the firm, of which he chaired the Client committee. He works extensively for clients in the Telecom Media HighTech and Energy sectors as well as for public and health institutions on a variety of strategic and operational issues including major transformation programs. In addition to his client work, Eric has conducted several research projects with the McKinsey Global Institute, such as “Reinvigorating Industry in France” (2006), Beating the recession: Buying into new European consumer strategies” (2009), “Better for less: Improving public sector performance on a tight budget” (2011), “French employment 2020: Five priorities for action” (2012), “Investing in growth: Europe’s next challenge” (2012),“A new dawn: Reigniting growth in Central and Eastern Europe” (2013), « Revitalizing the French labor market to massively create jobs » (2014) , “Accelerating the digitalization of companies: a pool of growth and competitiveness for France” (2014), “Global growth : Can productivity save the day in an aging world ?” (2015), “A window of opportunity for Europe” (2015) and “The power of parity: How advancing women’s equality can add $12 trillion to global growth” (2015). Eric Labaye has initiated and co-led the McKinsey’s “Women Matter” research program, which since 2005 aims to promote gender diversity in large companies’ senior management. He received the Lowell Bryan award which is given by the McKinsey women Directors to the person who has done the most to further the professional development of women in the Firm. Mr Labaye has been a member of the “Commission pour la Libération de la Croissance Française” (Release Growth in France) in 2007-2010, and a member of the “Commission Economique de la Nation” (French National Economic Commission) in 2005-2014. He is involved in the educational and cultural fields where he contributes to several development initiatives and is a member of the board of Telecom ParisTech, the International Advisory Board of Essec, and the board of Advisors of the School of Public Affairs of Science Po. In 2009, he was also a member of the Commission in charge of defining a new model for the French University Hospital system and the development of IHU (University Hospital Institutes). Prior to joining McKinsey in 1985, Mr Labaye was a member of the “Corps des Télécommunications” at France Telecom. He is a graduate from Ecole Polytechnique and Telecom ParisTech and holds an MBA with distinction (Henry Ford II award) from INSEAD.